If you really wanted to find a needle in a haystack, all you'd have to do is give the scent to a SAR dog and he or she will get right to the point. A search and rescue dog in training at an urban SAR training event, sniffing a pile of rubble for a volunteer who is "buried" somewhere below. We're all familiar with the classic image of the Saint Bernard and a barrel of spirits hanging about its neck as he comes to the rescue of an unfortunate soul trapped by an avalanche. For decades this image represented one of man's best friends the Search and Rescue dog. SAR dogs are some of the most enthusiastic and determined animals that we have the good fortune of associating with, owning, training and handling. Just for the record, the purpose of the spirits was to raise the person's body temperature and prevent hypothermia. Today there aren't many SAR dogs carrying spirits around in sub-zero climates, but there are plenty of breeds with the same enthusiastic temperament doing search and rescue with remarkable success. And that's the word that best suits SAR dogs. Remarkable. 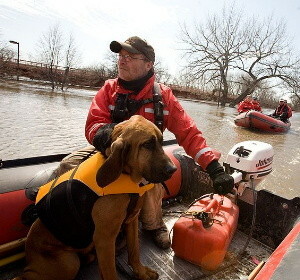 Valley Water Rescue member, Mike Knorr with search and rescue dog, "Barnaby" after flooding in North Dakota. Breeds such as Saint Bernard and Golden Retriever make excellent alpine rescue dogs since they take to the cold environment. Other heavy coat breeds like Newfoundland and Labrador Retrievers make excellent water rescue dogs, because their love for swimming makes them enthusiastic about training for flood and river rescue. Rescue dogs that are trained for alpine and water rescue have to get accustomed to traveling in boats, four-wheelers, snowmobiles and helicopters and taking long hikes. Not exactly a boring life for a dog, wouldn't you say? Search and rescue dogs have a certain temperament that combines a strong prey drive with a desire to please their handler and breeds that exhibit these traits are candidates for SAR dog training. Most trainers will agree, the important thing is obtaining a herding, sporting or working breed from a reputable breeder and imprinting with SAR dog training at the earliest possibly age. Pups should start obedience training at 8-10 weeks old and transition to SAR dog training at 4 or 5 months. Alerting to a scent is the "101" of SAR dog training and schooling includes the elements of release and recall, followed by reward and praise. Even though the training is seriously intense, finding an object is taught as a game, which keeps the trainee enthusiastic. One trillionth of a particle! Dogs have the ability to smell one-trillionth of a particle, which allows them to follow scent in the air or track it on the ground hours after it has been dissipated by exhaust fumes or distorted by foot traffic. WOW! 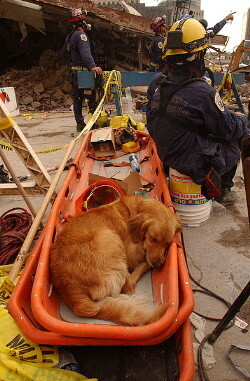 FEMA's Urban Search and Rescue teams search for survivors amongst the wreckage of the World Trade Center while a SAR dog takes a well earned break. At the 6-8 month range, dogs that exhibit certain qualities can be specialty trained to search out a particular scent each time they are deployed. Cadaver dogs are trained to the properties that are unique to the scent of a corpse, while gun and drug dogs are trained to track and alert at those scents. Other breeds like Shepherd and Collie can be trained to find a new scent each time, and these animals are extremely valuable in finding lost and missing children. A handler will show the dog an object with the childs scent and release the dog to "find Tommy". An effective training exercise might have the trainer hide an object, show the scent to the dog and give the command to "find baby". Whatever the method, consistency with repetition & persistence is the key to success. Great video on alpine training. Here's a clip demonsrating how a dog persists, even when it can't find the scent. Video by an agency that handles SAR dogs. Here's a link to an SAR dog fact sheet and also SAR Dog.org. Note: Qualifying a young dog for certain duty is one of the reasons SAR dog training is so productive and it's up to the trainer to observe and access young trainees to make these determinations during initial training. SAR dogs that will work rubble and debris from earthquakes or storms are trained to alert by barking and scratching hard when they are on the spot. So, during training the dog can be encouraged to scratch, bark an alert, get under the bucket or box and retrieve the object. At the next level the dog is given a scent and when on track, taught to associate the alert with speaking. This is a simple progression and every trainer has a proven method of arriving at the same result. With advanced training comes the human element in the form of a second trainer or a volunteer. The dog is shown the scent as "friend" then the person will hide and allow the trainer to get the dog's attention focused elsewhere. Then the scent is reintroduced and the dog is released to "find friend". In all training scenarios, finding the person or the object is finalized with positive reinforcement. It's never certain where a SAR dog will have to go in order to track or follow a scent. SAR dogs must learn how to climb ladders, walk on narrow ledges and climb trees, and all of these are taught through any number of typical methods. For urban environments, SAR dog training teaches the animal to search in crowded places such as a mall, around equipment and machinery that are in warehouses, and also in basements, under houses, in elevators and in stairwells. In many situations there are things such as heavy equipment or unsupported building sections could be a danger to the animal releasing only on command is extremely important. In the field, it's the handler's responsibility to make absolutely certain the situation is safe to deploy the SAR dog. Training a dog to track on verbal and signal commands is essential for other types of SAR dog work. In the field, and especially if more dogs are deployed to cover a large area, the handlers must direct their dog in order to maintain an organized search. Similar methods are used to train herding and sporting dogs and it all starts with commands on a lead, accompanied by reward and praise. Then the lead is held in sight of the dog and the training continues. By combining the bucket drill with fetch and retrieve hand commands a dog can be trained to understand it is searching in a particular way. Once a dog picks up a scent it is encouraged to track that scent to the source. The trainer can devise any number of scenarios for this aspect of SAR dog training. Search and rescue dog training is extensive, exhaustive and intense for both the animal and the trainer. However, the reward is a remarkable animal that is extremely valuable in terms of saving human lives. Fully trained SAR dogs can pretty much find a needle in a haystack had you trained the dog to hit on the scent! Search and rescue dog training focuses on reinforcing the incredible natural ability of canine scent. The nose "knows" and to smell like a canine your nose would need to be about 3-feet long! Combine the natural ability of detecting one trillionth of a particle with a strong prey drive.. reinforced with repetition and positive praises and you could train your pup to search and rescue just about anything. Scent recognition will vary by breed yet it's the scent we are focusing on. However, all breeds will not make great SAR dogs! Breeds developed to have short noses and/or under bites wont excel at SAR work compared to others. Follow the scent and hit additional working dog training targets with links provided on our working dog training page.